Maria Sharapova’s quest to capture both the Indian Wells and Miami titles in the same season is still on track. Today at the Sony Open, Sharapova bounced countrywoman Elena Vesnina 6-4, 6-2 to book her spot into the fourth round. At their last showdown in 2010, it was Vesnina who recorded the victory over Sharapova. With these two tied in their head to head 1-1 and Vesnina winning her maiden WTA title in Hobart this January, a decent row was expected between these Russian rivals. Vesnina got off the block strongly with a love hold to start the match. After Sharapova’s double fault resulted in triple break point, Vesnina later converted for 3-1 when her counterpart misfired with a forehand stroke. Yet, Sharapova promptly struck back with a break of her own to level the first set at 3 all. Another perpetual game ensued where on a fourth break point opportunity, Sharapova capitalized for 4-3. Soon, Sharapova consolidated for 5-3. Despite being challenged on serve, the world number two eventually bedded the opening set. Subsequent to an interminable game to arrive at 1 a piece. Sharapova manufactured triple break point and cemented a 2-1 lead. Henceforth, Sharapova was on cruise control securing a second break and ultimately closing out the last set easily. Does one game give a glimpse into the outcome of a match? Perhaps. Looking back on the seventh game of the first set, Sharapova stated “I was down 1-3. . . I felt I had a bit of momentum. . . It was a really long one, I was ready for a water break. . .It was a very important game”. Considering the blistering wind and the hot temperature, Sharapova expressed that it was “one of those days when you know you might not be playing your best tennis. . . I got through and on to the next one”. Next up for Sharapova will be Klara Zakopalova. The latter defeated Maria Kirilenko 7-6, 6-4. Sharapova has bested Zakopalova in four of their five meetings, the last one was in Doha this February. Earlier in the day, sixth seed Angelique Kerber was booted by Sorana Cirstea 6-4, 6-0. Cirstea will clash in the fourth round with Jelena Jankovic who defeated Nadia Petrova. American teenager Lauren Davis’ run was halted at the third round by Alize Cornet who triumphed in three sets. Reigning champion Novak Djokovic takes the court on the first Sunday of the tournament. The Serb battles Somdev Dewarman in the third round as he attempts to pocket his third successive title at the Sony Open. Four time finalist Maria Sharapova faces fellow Russian Elena Vesnina in the round of 32. Sharapova is trying for the second straight year to reach the finals at both Indian Wells and Miami. Two years ago, Caroline Wozniacki advanced to the final in Charleston but went down in straight sets to Sabine Lisicki. Last year, an ankle injury during the first set of the semifinals caused Wozniacki to forfeit the match. Today, Wozniacki made up for past disappointments. The world number one vanquished Elena Vesnina 6-2, 6-3 for her first championship at the Family Circle Cup and her third title of the season. Wozniacki’s road to the final was treacherous. The Dane prevailed in two tough tiebreaker sets in the third round. Wozniacki overcame Yanina Wickmayer serving for the match in the quarterfinals and battled past Jelena Jankovic in the semifinals. For her part, Vesnina beat defending champion Samantha Stosur in the third round and knocked out two seeded opponents in the quarter and semifinals. Thus, Vesnina was hoping to cap her week with another great victory and get her maiden WTA title after failing on four prior occasions. In their head to head, Wozniacki had a 4-1 record against Vesnina including two semifinal wins at Ponte Vedra Beach on clay in 2009 and 2010. Consequently, Vesnina would need to do something special to walk away with the trophy. With a backhand volley winner, Vesnina arrived at break point. Yet, with a crosscourt backhand winner, Wozniacki took care of that. Finally on her fifth game point chance, Wozniacki held for 2-1 in the first set. Then, with a backhand down the line winner, Wozniacki had double break point. When Vesnina dumped a forehand into the net, Wozniacki secured the break and consolidated for 4-1. Later, Wozniacki broke Vesnina a second time to bank the first set. After dismissing a break point in the first game of the second set, Wozniacki manufactured a break point. However, Vesnina came up with a great backhand volley and eventually held for 1 all. Two time Sony Ericsson Open finalist Maria Sharapova commenced her bid for the title by trouncing her third round rival. Sharapova destroyed Sabine Lisicki 6-2, 6-0. From the first ball strike, Sharapova made her presence felt. After an early break and consolidating, with Lisicki serving at 2-4, Sharapova went up triple break point. Although Lisicki got to deuce, it was just delaying the inevitable. In the end, Sharapova captured another break and closed out the set. After getting the break the initial game of the second set, Sharapova rolled on to clinch a spot into the third round. This week, the U.S. Open draw was disclosed. Caroline Wozniacki, the world number two and 2009 finalist, and Kim Clijsters, the defending champion and world number three, are the top seeds. Yet to fully recover from foot surgery, Serena Williams, the world number one, pulled out a few days ago. In the absence of such a fierce competitor, this presents a sweeping opportunity for Elena Dementieva, Jelena Jankovic, Victoria Azarenka or Wozniacki to emerge as a first time champion at a major. Whether one of these women realizes her potential will be contingent on the performance of those who have previously hoisted this trophy such as Maria Sharapova, Venus Williams, Svetlana Kuznetsova and Clijsters. Here’s a look at how the draw shapes up. With the biggest title of her career at the Rogers Cup earlier this week, Wozniacki heads into New York with a wealth of confidence. But, being the top seed at a major is an unfamiliar status for the Dane, how she handles the pressure will be key. Wozniacki may need every ounce of mental fortitude to get through the round of 16 where 2007 U.S. Open winner Sharapova will be her likely adversary. In Cincinnati, Sharapova suffered a foot injury. If Sharapova is at full capacity, Wozniacki could find her claim to her first major postponed another year. After a difficult few months whereby her ranking dropped outside the top 10, Kuznetsova’s game appears to be clicking again as evidenced by a recent title in San Diego. As a potential quarterfinal opponent for Sharapova or Wozniacki, the 2004 U.S. Open champion is someone to keep an eye on in the top half of the draw. The same applies for 2010 Australian Open semifinalist Na Li who will be searching to go one step further at the U.S. Open. For that to happen, Li may have to knock out Kuznetsova in the round of 16 and stop either Sharapova or Wozniacki in the quarterfinals. Also, Maria Kirilenko and Aravane Rezai are two dangerous competitors who may prevent any of these players from advancing to the quarterfinals. In the bottom part of the top half of the draw, if the script follows the seeding, Vera Zvonareva and Jankovic will face off in the quarterfinals. Lately though, Jankovic has been plagued by a myriad of injuries resulting in her downfall in the early rounds at the warm-up events. Thus, the Serbian could be ousted in the primary stages by 2009 U.S. Open semifinalist Yanina Wickmayer or 2010 Wimbledon quarterfinalist Kaia Kanepi. Being a Wimbledon finalist in Zvonareva’s case could be a blessing or a curse. In light of that experience, the Russian should have the belief to foil any potential upset in the round of 16 by rivals such as Nadia Petrova or Agnieszka Radwanska. Conversely, Zvonareva’s desire to erase that disappointment could lead to additional pressure and open the door for her counterparts. If the results of the recent tournaments are any indication, it will be a Wozniacki versus Zvonareva semifinal or an all Russian affair, Zvonareva versus Sharapova. Since Wozniacki defeated Zvonareva in Montreal, the Dane would have the edge. If it comes down to a test of wills between Sharapova and Zvonareva, the former would have the upper hand. At the Western and Southern Financial Group Women’s Open, Kim Clijsters survived three championship points from Maria Sharapova just as the skies were opening. When the match resumed after a 70 minute rain delay, Clijsters, the 4th seed, changed not only her outfit, but her game. Clijsters worked her way back to rob the trophy from the 10th seed with a 2-6,7-6,6-2 victory. Although Clijsters had a slim edge over Sharapova in their head to head at 4-3, the latter had prevailed at their ultimate three meetings. However, a lot had taken place since the 2007 Australian Open semifinal, the last time Clijsters and Sharapova clashed. For Clijsters, the wanting of a family and marriage pushed her away from competition for almost two years. Yet, in the summer of 2009, Clijsters marked her returned on tour in grand style with the title at the U.S. Open. Sharapova had a near 10 month absence from the game due to shoulder surgery. Since getting back in May 2009, Sharapova’s serve, one of the principle components which propelled her to three major titles, has been unpredictable. Strangely enough, it was Clijsters’ serve which was her Achilles heel from the outset. After being ahead 40-15 in the first game, Clijsters double faulted to give Sharapova break point. Despite recovering and salvaging a 0-40 game subsequently, Clijsters could not find any answers to an attacking and aggressive Sharapova. After fighting off two break points to arrive at 2 all, from 15-40, Sharapova aided by miscues from Clijsters got to deuce. Then, when Clijsters’ backhand crosscourt sailed long, Sharapova had her fifth break point. The Russian banked the break when Clijsters committed her fourth double fault. After consolidating for 4-2, Sharapova’s provoked three consecutive backhand mistakes from Clijsters to obtain a second break. Next, with a love game, Sharapova closed out the set. Clijsters opened the second set with a love hold. Once Sharapova netted a backhand, Clijsters had break point. With a backhand return winner, Clijsters capitalized for a 2-0 lead. But, with two errors and a double fault, Clijsters faced triple break point. With another Clijsters’ backhand going out of play, Sharapova was back on serve. Later, on a deep return by Sharapova, Clijsters dumped her next stroke into the net handing Sharapova double break point. As a result of Clijsters’ forehand up the line landing wide, Sharapova captured the break for 4-3 and went on to consolidate for 5-3. By unleashing on a forehand return, Sharapova struck a winner for match point. With Sharapova sending a forehand crosscourt long, Clijsters got to deuce. Two more championship points followed for Sharapova with Clijsters successfully salvaging both. On the game’s fourth deuce, the rain intensified causing play to be stopped. When the women took the court after the weather interruption, a new Clijsters quickly guarded serve for 4-5. With Sharapova serving for the title, Clijsters coaxed the Russian into two backhand errors to earn double break point. Thanks to a couple of big second serves, Sharapova brushed those aside for deuce. However, another backhand miscue by Sharapova led to break point for Clijsters. As a result of a double fault, Clijsters leveled the set at 5 all. The second set was decided by a tiebreaker. By double faulting on the initial point, Clijsters gifted Sharapova a mini-break. The Russian went on to take a 3-0 lead. Because of mistakes by Sharapova including a double fault, Clijsters seized the next five points. After Sharapova erased the mini-break advantage, she double faulted to give Clijsters a 6-4 edge. As Sharapova misfired with the backhand crosscourt on set point, Clijsters was back in contention. In the finals of the MPS Group Championships, Caroline Wozniacki, the top seed and defending champion, terminated Olga Govortsova 6-2, 7-5 for her first title of the year. After defeating second seed Alona Bondarenko in the first round, Govortsova took care of third seed Dominika Cibulkova in the semifinals. Therefore, Govortsova was hopeful that her third career WTA final would produce her maiden trophy. The problem was that Wozniacki had other intentions. Govortsova commenced well, breaking Wozniacki to open the match. However, Wozniacki promptly erased her rival’s lead and under pressure held for 2-1. Subsequently, with an overhead winner, Wozniacki obtained her second break point of the game. Caroline converted when Olga netted a backhand. After salvaging break point, thanks to a few forehand errors by Govortsova, Wozniacki consolidated for 4-1. The next game despite two double faults and two break points, Govortsova guarded serve to keep in touch at 4-2. But, down 2-5, Govortsova let a game point evaporate. Then, with a forehand crosscourt winner off a dropshot, Wozniacki had break point. Wozniacki banked the set when Govortsova committed another error. By attacking, Govortsova built a substantial lead in the second set. Two double faults and too many errors by Wozniacki permitted Govortsova to break for 2-1. Subsequently, the Belarusian sponged over double break point to secure a 3-1 lead. Later, with a forehand up the line winner, Govortsova arrived at 0-40. With a forehand crosscourt winner, Govortsova stretched her advantage by double break at 4-1. Still, because of multiple mistakes her next game, Govortsova dropped serve. But, as Caroline served at 2-4, Olga produced another winner for break point. Yet, with spectacular defense, Wozniacki maintained serve for 3-4. As Govortsova served for the set at 5-4, after wiping out a break point, she arrived at set point. But, when Olga dumped an uncomplicated backhand volley into the net, the players were at deuce. Down the road, after salvaging five break points, Govortsova obtained another set point. Again, because of a mistake, Govortsova failed to convert. With a forehand from Olga flying long, Caroline had break point number seven. Govortsova double faulted to level the set at 5. After Wozniacki held at love for 6-5, Govortsova crumbled. With a forehand miscue, a backhand crosscourt long and a double fault, the Belarusian handed Wozniacki triple championship point. By Govortsova netting a backhand, Wozniacki captured her second straight MPS Group title. Two years in a row, Wozniacki has clawed her way into the finals by overcoming Elena Vesnina in the semifinal round. Yesterday, Wozniacki was down a set and a break, into the latter stages of the second set. When Wozniacki was asked the secret of her success in Ponte Vedra, she simply stated “I love coming back here”. For the second time in her career, Wozniacki defends a title. Last year, Wozniacki did the same in New Haven. A finalist in Charleston in 2009, Wozniacki will attempt to sustain this excellence at the Family Circle Cup this week. At the Sony Ericsson Open, for the second consecutive match, Caroline Wozniacki struggled. But, the world number two found a way to prevail 1-6,6-1,6-4 over Maria Kirilenko. After holding serve, Kirilenko produced a volley winner to set up break point. When Wozniacki’s backhand sailed long, Kirilenko broke for 2-0. Subsequent to consolidating, Kirilenko’s aggressiveness by coming to net paid off again as she captured a second break. Bothered by the humidity and a viral ailment, Wozniacki required a medical time out down 1-4. Kirilenko ran away with the first set the next two games. As Wozniacki adjusted to the conditions, her play improved. Caroline took control of the second set forcing a decisive third. At 3 all, Wozniacki obtained double break point. Although Kirilenko got to deuce, down the road, with a couple of winners, Wozniacki broke for 4-3. Yet, the next game, Kirilenko erased game point by her opponent and leveled the set at 4 a piece. However, with a forehand error, Kirilenko donated double break point, Wozniacki accepted the gift with a forehand up the line winner. Later, with a forehand crosscourt winner, Wozniacki secured the victory. Q. Do you think it was hard for Maria to play against you knowing she saw something might have been wrong? Was [it] hard for her to change tactics or [did she think] you might not make it the whole match…? WOZNIACKI: I don’t know. That’s difficult for me to say. She played a great first set, and she gave me the chance to come back in the second, and then I got the belief and I started feeling better. I just kept hanging in there, and my fighting spirit got to me and I was there. Q. You made it to the finals last week at Indian Wells. Do you think maybe also part of it is fatigue that you’re experiencing with a lot of tennis the last few weeks? week tournaments just like the Grand Slams. Everybody is playing. It takes a lot of strength not only physically but mentally, as well. You don’t really get to come down after such a big final, so I think maybe it just got to me. Then I had a huge match the first day where I almost went out, and I just think that just took everything out of me. Again, my fighting spirit didn’t give up, and I’m still here. Another easier than expected day at the office for Kim Clijsters; she crushed Shahar Peer 6-1, 6-0. In two matches, Clijsters has dropped only one game. Clijsters is unlikely to have a walk in the park her round of 16 match, she takes on defending champion Victoria Azarenka. In great form, Azarenka beat Lucie Safarova 6-4,6-2. Q. What was most troubling to you about her game? HENIN: Well, she plays well, you know, she runs a lot, and she has [a] pretty good backhand. She’s a real fighter. I mean, she has a strong personality, and it was the first time I’ve played against her. That’s never easy to play someone you don’t know. So that was something new for myself. But, I mean, I was glad about my reaction in both sets to come back. And especially after a good win two days ago, it wasn’t that easy today, but I’m glad I’m in, you know, in the last 16. Henin’s next round opponent is Vera Zvonareva. The latter won in straight sets against Sara Errani. In the night session, Jelena Jankovic vanquished Elena Vesnina 7-6,6-3. Sam Stosur, Jankovic’s subsequent challenge, stormed back after dropping the first set to Virginie Razzano 4-6,7-5,6-1. 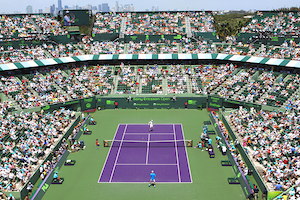 The Sony Ericsson Open’s fifth session offers a plethora of fascinating matches. The ATP begins its third round action with the bottom half of the draw which includes Rafael Nadal and Andy Roddick playing. Conversely, the women’s bottom half which comprises players such as Jelena Jankovic, Kim Clijsters and Justine Henin finishes off its third round. First up on stadium court are Kim Clijsters and Shahar Peer. At their only meeting in Sydney in 2007, Clijsters had a straight sets victory. A quarterfinalist at the 2007 U.S. and Australian Open, Peer’s game has evolved over the three years. Therefore, this has the promise of an intriguing match. After the ladies, Rafael Nadal and David Nalbandian take center stage. Since coming back from hip surgery in 2009 and an abdominal tear this January, earlier this month, Nalbandian carried his country to a quarterfinal berth in Davis Cup. Although Nalbandian is now ranked 161st , with his having a winning record against Nadal, the Spaniard will be on his toes. Later on stadium court, Maria Kirilenko collides with Caroline Wozniacki. The latter is 4-0 versus the former; they last met two weeks ago also in the third round at Indian Wells. The afternoon session terminates with Andy Roddick facing Sergiy Stakhovsky. On his way to capturing the St Petersburg Open last year, Stakhovsky defeated former world number one, Marat Safin. Although this is their initial showdown, Roddick could be tested. On the grandstand, Henin battles Dominika Cibulkova. A first encounter for both ladies, it will interesting to see which one stands tall after the match. Victoria Azarenka meets Lucie Safarova. The defending champion has a perfect 3-0 record against Safarova. Another first time meeting is John Isner versus Juan Carlos Ferrero. On the outer courts, Sam Stosur and Vera Zvonareva both square off versus opponents against whom they have unblemished records. At night, Jankovic clashes against Elena Vesnina. Jankovic owns her rival 4-0 in their head to head series. That’s followed by Jo-Wilfried Tsonga and Phillip Kohlschreiber. These players have split their prior two matches.